Located conveniently in Holland Village, Baden is a great central place to head to meet up with friends to watch a good game of football while having some great food and drinks while you’re at it. Some popular must-try mains here would be their curry-wurst and pork knuckles. Wash that down with a nice, cool German beer to put yourself in a good mood for a great night. Bar Bar Black Sheep is a great place to go to if your passion for food is as large as your passion for soccer. With over 150 items on the menu to choose from, you can go there religiously to watch an entire season of the English Premier League and still not have tried everything on their menu. Our favourite here has to be their Full English Breakfast and Battered Fish & Chips, which go really well with a nice pint of cold beer. If you’re craving Asian food, they have local, Thai and Indian options as well for you to choose from as well. This Aussie bar is known as “Singapore’s home of live sports” for a reason, so we definitely had to include it in this list! Here, you get to watch the match on large, HD screens, so no one has to jostle around for space. Their Facebook page also always has an updated list of what games they will be showing, which makes things very convenient. They serve some really solid, classic Aussie food and beer here, which goes great with a good match of football. We love their Devil’s Ribs and Boomerang Deluxe Pizza which are great for sharing around. If the drinks are making you feel a tad more daring than usual, you can always try their Peppered Kangaroo Loin as well. 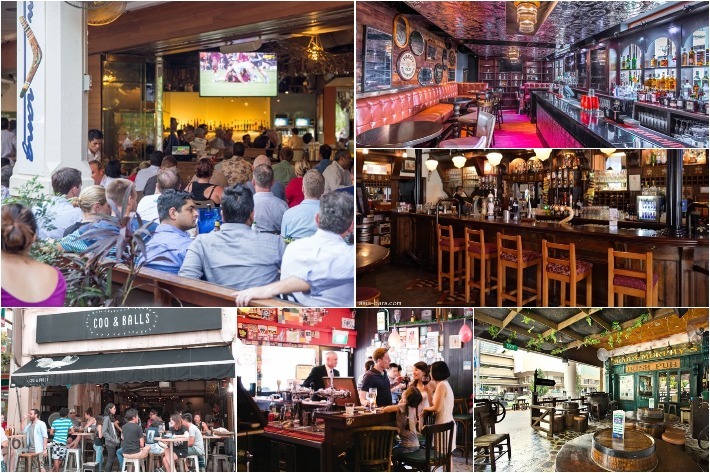 We all know Char Grill Bar for their affordable and delicious western fare, but did you know that their Holland Village outlet screens football as well? That just gives us another reason to love this place even more! Char Grill Bar has generous, large portions, which is good for a long night of watching football. Our favourite here would have to be their classic Char-Grilled Chicken or Prime Black Pepper Steak with a side of Mexican Cheese Pasta and Baked Potato. The name of this place never fails to make us giggle, but aside from that, this place is a great cosy and quirky place for you to watch the game with some friends. Located in a cosy corner of Tiong Bahru, this place is easily accessible as well. What’s more, this place sells pretty affordable food and drinks so you don’t have to worry too much about breaking the bank. This place sells great craft and premium draft beers, which goes really well with the food served here. Some great appetizers here would be their Tom Yum Fries and their Mini Wagyu Beef Sliders. For mains, we recommend you try out their Fish & Chips and Coq & Balls Cheese Burger. Harry’s is one of the more well-known places on this list. With 21 outlets islandwide, you don’t have to worry about travelling too far just to watch a match. They make life even easier by having an online calendar that shows which game is on, so you know that you won’t be making a wasted trip down to watch the wrong match. They serve really good food here too as well decently priced beer. If you’re going down with a large group of friends, we recommend you to get one or two of their sharing platters to feed the masses. Our favourite would have to be Harry’s Seven and Amigo Nachos. Special shoutout to their nachos, they do them really well. Jolly Roger is a British-style pub that sells great drinks and amazing home-cooked British food. We love how the place is decorated with vintage decor and walls full of interesting photographs, making the environment very cosy, just like home. We recommend you try out some of their speciality drinks such as their Crystal Head Vodka, Forbidden Paradise and Treasure Island. When it comes to food, we love their classic beer battered fish and chips that goes really well with a cold beer. 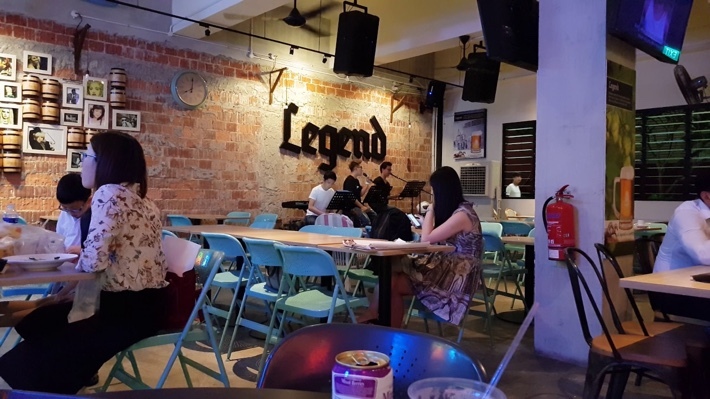 This place is a modern Kopitiam that is popular among the residents. This place has both indoor and outdoor seating, making it very nice and spacious. You can enjoy the scenic view along Punggol Reservoir while sipping on some ice cold beer during halftime. People love this place for their dirt cheap house beer and 1-for-1 towers on weekends. They also sell really nice food. We love their Vongole Pasta as well as their Hot & Spicy Wings. We love the interior of Mcgettigan’s—it’s the definition of classy with a rustic touch. They take their sports very seriously, and besides football, they show other live sports matches such as rugby, golf and UFC. When it comes to food, we love their Bangers & Mash as well as their McGettigan’s Full Irish Breakfast. For something more interesting you can try their amazing Pork Belly Popcorn. Wash all that down with an ice cold beer and you are good to go for a good night of football. Muddy Murphy is a cosy, authentic Irish pub that is frequently patronised by expats. It has large screens to showcase all those intense football matches, so you know that the view you’ll be getting is good. We love the atmosphere here—it’s always so lively and happy! They have an excellent selection of beers and offer more than 15 varieties. When it comes to food, we are spoilt for choice; pretty much everything here tastes amazing! If we had to choose, it would be their Irish Stew, Beef and Guinness Pie as well as their Fish & Chips. Qasr is different from the other bars mentioned in terms of food. Instead of the usual western or local fare, they serve up some really bold and delicious Lebanese and Middle Eastern cuisine instead. Some of our favourites here would be their meaty Sultani Kebab as well as their Shish Taouk, which are chicken cubes that are skewered with mushrooms and marinated in a mustard and garlic mayonnaise. They also have a pretty extensive drinks menu that draught beers, bottled beers, cocktails, premium spirits and much more. Stepping into this place makes you feel like you’ve travelled all the way to Europe. Fun fact: The interior of this place was exclusively designed, built in London and then shipped all the way to Singapore, so it really is almost like you’re actually in a London pub. They offer hearty, classic English food that comes in generous portions. We love their Sunday Roast Beef as well as their Bread & Butter Pudding. They also have a wide selection of drinks to keep you going throughout the game.